A few months ago I watched a remarkable television show: Stephen Fry and the Gutenberg Press. Maybe you watched it too; because I'm a letterpress printer, I've had a lot of people ask me if I saw it. I did: it was part investigation into the way Gutenberg had earned his reputation as the Father of Letterpress, and part documentary about the recreation by a group of British press enthusiasts of a wooden hand press similar to Gutenberg's. If you did watch the show, you'd remember that Gutenberg didn't actual invent the press itself, as hand presses had been used for printing woodblocks before his time. No, he is the Father of Letterpress for inventing a process to easily cast individual metal letters for the purposes of printing. It was much more of a jeweller/blacksmithery type of invention, really, and of course it revolutionised information technology as the world knew it. 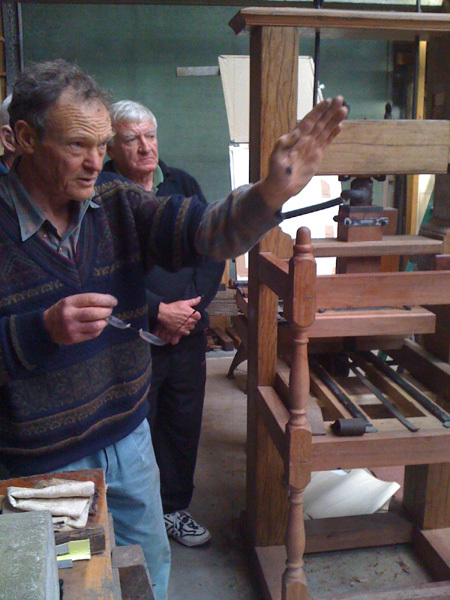 While I was watching the show I remember thinking that, in my limited experience of Australian letterpress, and in my broader virtual observances of overseas letterpress, there seems to be two kinds of letterpress enthusiasts: those who live for the print, and those who love the machines. I've only known one person who combined elements of both, and he produced beautiful work. Myself, I'm a print person, someone who loves what the process does rather than the process itself. I'm not particularly interested in the machines, and when something goes wrong with a press I'm working with, I’ll try to fix it intuitively, but if that doesn’t work I’m not afraid to look girlie and call people who are much handier with a spanner and screwdriver than I.
Canberra has a Museum of Printing quite close by in Queanbeyan; it's full of machines of different vintages, and that use different technologies, from iron presses to platen presses to cylinder presses and a working linotype machine. 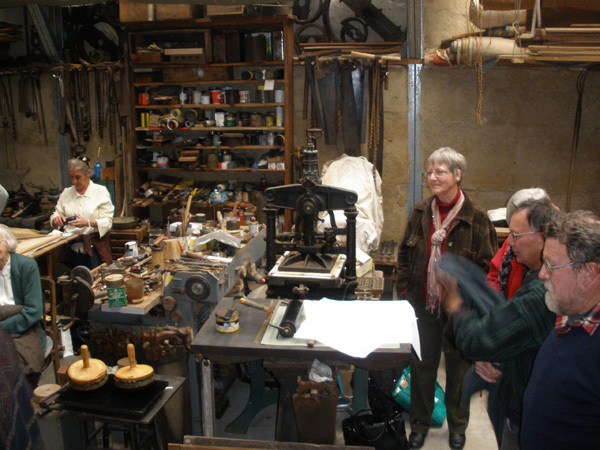 It was set up from the remnants of the Queanbeyan Age newspaper, and the people who run it (all volunteers, many of whom worked on the newspaper) love their machines. They get them working, they maintain them lovingly, and they print off the odd souvenir flyer to show the public what the machines can do. I don’t think there's a lot of print production happening there, and because I don’t worship the machines, I don't go there very often, which is quite remiss of me. 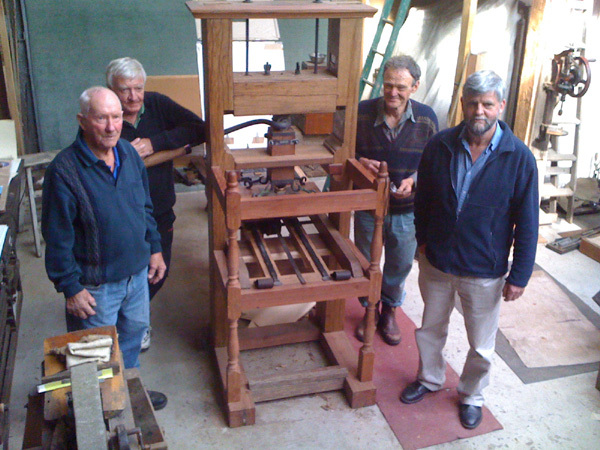 I bet all the QPM volunteers watched the Stephen Fry/Gutenberg show, and marvelled over the building of the wooden press; I bet they don't know, like I didn't, that a similar labour of love was happening just down the highway a bit. In Australia? Where most of our presses have been scrapped? Where it’s impossible to buy new metal type? Where the once quite healthy private press movement is now almost completely non-existent? Really? Let’s start with a little bit of printing history, a bit of context. I listed some printing presses above, but you probably don't know what I mean. Forgive me if I make a mistake here, I'm not a print history expert, I've just absorbed a few things in the time I've been involved with letterpress. 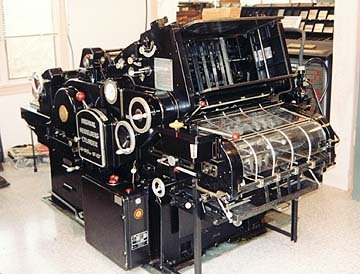 So, this is a press very similar to the one used by Gutenberg. 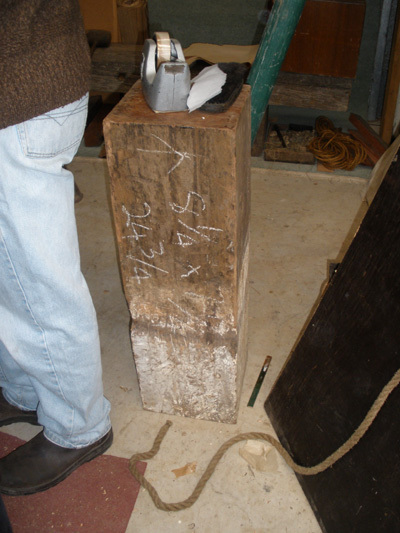 That first, wooden press is called the Common Press, because while there were many variants and slight improvements (and, I’d say, complete wackinesses) to its design over the centuries of its dominance, commonly they were all wooden with metal screws. I'm pretty certain that, up to now, we haven't had a Common press in Australia, as we were colonised around the time of the Iron Press. Did you know that the First Fleet had a press on board? I read somewhere that there was no-one able to use it, so it festered in a hut for many years before being hauled out and put into use. One day I'll find that fact again and actually write down the details. I received a hand-addressed letter a month or so ago, in gorgeous penmanship of a kind I haven’t seen in years. I had only seen the sender once in the last fifteen years, and that was only a few months before the letter arrived. He's one of those wonderful eccentric Australian people that set themselves up in the bush and do whatever the hell they want and the rest of the world can be buggered. When you get talking to them, they've had an interesting life, and are usually very well educated. This man, Richard Jermyn, is no exception. I don't know a lot about Richard Jermyn. I've been told various stories, such as he is an ex-Navy man; he was an architect, so forth. I don't really know what is true and what apocryphal from the various stories. What I do know for certain is that he has a strong interest in letterpress and printing, and used to have a private press in the bush near Bemboka, NSW called the Indian Head Press, named for a nearby peak in the Bega Valley. He lived near my parents, who have a lot of respect for him, and they took me to meet him when I first started showing an interest in type and printing. I lost contact with him; he sold his Bemboka property and moved further south. Apparently he gave a lot of his equipment to the Powerhouse Museum in Sydney, and only kept the basics, and that’s the last I heard for a long time. Then earlier this year I taught a bookarts workshop in Bega, and he popped in to say hello. I had a couple of my fine press books with me, and I was delighted when he looked through them seriously, with care and attention to detail, and then looked at me soberly and said 'good pressmanship' with the same sense of approval that the farmer says 'good pig' to Babe at the end of the movie, and I felt so happy I thought I would burst. I have had the pleasure of having my books admired by good people, but when an experienced pressman praises, it really means something. So, the letter. It was only a computer-generated and photocopied invitation, but the content was very exciting. Of course I went, how could I not? I took my mother, a local historian who could also appreciate the importance of the occasion. It was a most enchanting experience: driving down the highway to the furthermost eastern corner of the state, turning into a rough narrow dirt road just off the main road to discover a large green Colourbond shed surrounded by the usual scrap and detritus that is common to most farm barns, plus a rugged vegie patch and a rudimentary washing line full of simple clothes: shirts, worker's shorts, socks. Outside the door of the shed was a table set up with wine and nibblies. Not wanting to drink, I asked for something non-alcoholic, and was poured a glass of water from the tap attached to the rainwater tank. A bit of chat with the others gathered around – mostly friends and press-making collaborators, only one other person having anything to do with printing – and then we were allowed into the 'Tin Tent' to discover a completely different world. I was expecting... I guess I was expecting the usual printer's set-up, arranged around the inside of a green tin shed. I wasn’t expecting the ambience of hand-cut wooden beams and carefully yet carelessly arranged arrangements of various collections – saws, lathes, timbers, chains, plugs, books, tins. among many, many collated things – up the walls and on a big mezzanine that is obviously a living quarters as well. It was a living working space, one indistinguishable from another. 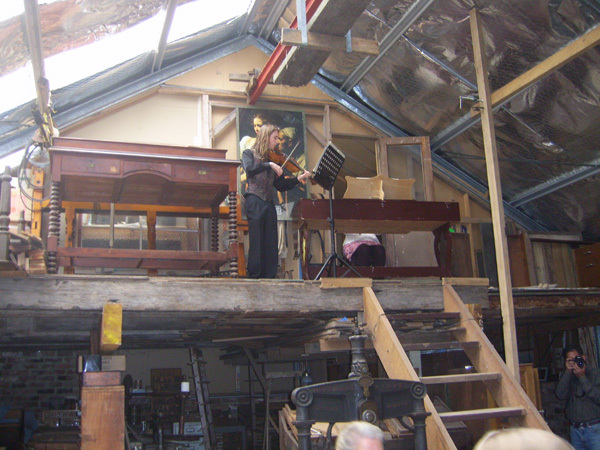 Richard had arranged for some local musicians to sit up on the mezzanine level with violin and harpsichord. They played (exquisitely) from above as we entered and saw, in a cleared space at the far end of the shed, the press that Richard and a group of friends had built by hand. 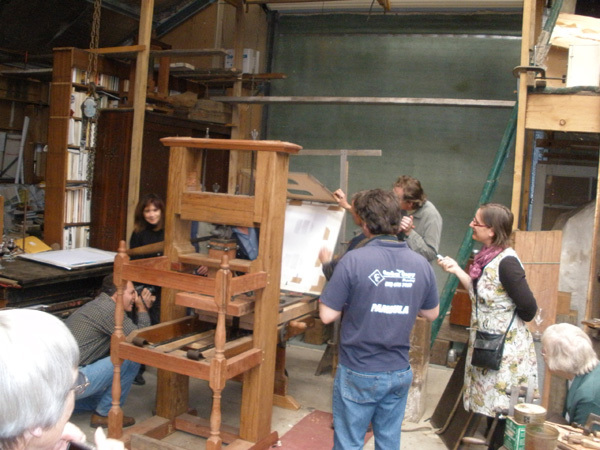 It was gobsmackingly wonderful to stand and look at this working replica of early printing history. I can’t begin to convey how privileged I felt to be there when it pulled its very first print. I had borrowed my mother’s digital voice recorder, and managed to record Richard’s opening speech. This was started at the beginning of the year; I think the first of January I started to first put plane to wood. I might just go through quickly a bit of the language of the common press, the various parts, and you’ll see on the printed matter that I’ve made a bit of an explanation and some of the background, but basically this press was derived from plans … from a double volume book called The Common Press, which is the documentation of the common press that is in the Smithsonian Institution in America. Without the plans in this book I would not have contemplated it, but I looked at it and thought ‘I’ll have a go at this’. Just shows the things you can do in a moment of rashness. The original plans called for oak, elm, beech timber, and the big departure has been that this is not European timber, this is all Australian hardwood. This is where Les and other people have come in. So, from the bottom down: the Feet are the hobs of the Tathra Wharf (there’s a story behind every piece), the Cheeks are (pretty ratty, you can see the difficulty of getting big enough timber)… basically wharf timber from North Bega. These pieces... that’s the Head, and the other big lump down the bottom, that’s the Winter; those two pieces take the whole of the impression. These are dove-tailed into the cheeks, there’s a big dovetail running up in here, top and bottom, and those pieces take the whole pressure of the press, and these are Roads and Traffic Authority guideposts. 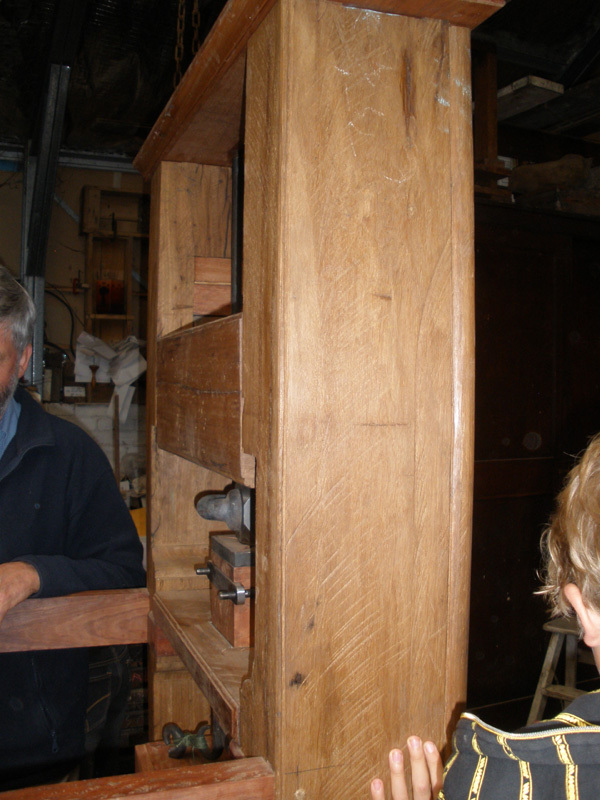 Part 3: Richard Jermyn: Details about the parts of the press and what materials they used. The detail, the terminology, it’s all something you’d expect to see and hear in a museum, but it’s alive and well in a tin shed in Pambula. Amazing. Apparently this press will outlive anything built in European wood, thanks to the hard woody goodness of our Australian timbers. Look at that woodcut of early printing again. See the inkballs used for printing? 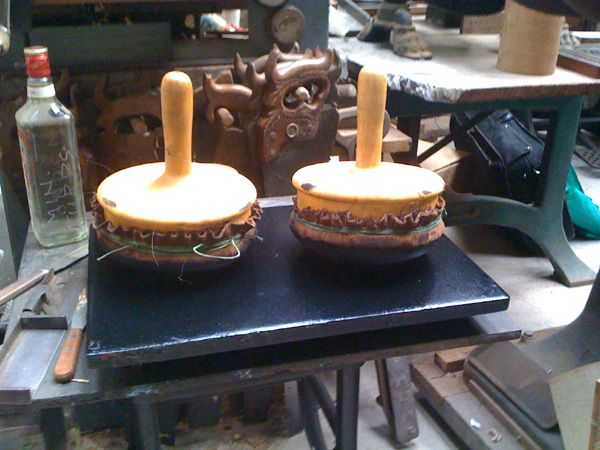 Richard had even put together a couple of those, made with wooden handles, horsehair and the remnants of a friend’s leather jacket. They worked really well, and he put a friend on printing duty while he supervised the press working. On dabbed the ink, the paper (dry, not damp: he didn’t dampen machine-made paper) was inserted onto the guides, the tympan (made from real vellum) lowered onto the frisket and the whole lowered onto the forme (which is the locked-up type). Then he got friends to turn the handle that moved the type under the platen, and pull the lever that lowered the platen onto the type to make an impression. That prints the first page. Then the forme is rolled further along and the second page of the sheet is printed. Don’t bother counting the typos: we know they are there, but there wasn’t time to change them, because the music was playing, and the wine was being slurped, and we were all taking turns to use the inkballs and turn the handle, and pull the lever – which, incidentally, explained a lot to me about why there weren’t many women in the trade. It’s hard work to pull that lever! I don’t think I could possibly print on that press regularly, although it would be akin to working out on a rowing machine, and probably very good for me. >Just in case you can’t see the image, the book he used to build the press was called The Common Press: being a record, description & delineation of the early Eighteenth Century Handpress held in the Smithsonian Institution by E. Harris, C. Sisson (London: Merrion Printers, 1978). He used local craftsmen to help with timberworking and the blacksmithing. He showed me the book after we stopped printing (only because we ran out of paper!) and it is incredibly detailed, with cross-sections, x-rays of inserts, plans and materials. Still, there’s no way I would look at something like that and think ‘I could do that’. I only do that with pictures of things people have printed. I think everyone came away from the Tin Tent that day feeling privileged and excited. Richard had invited the local media but they didn’t show, and it’s their loss. Richard told me that he has happily spent $10,000 building this press. 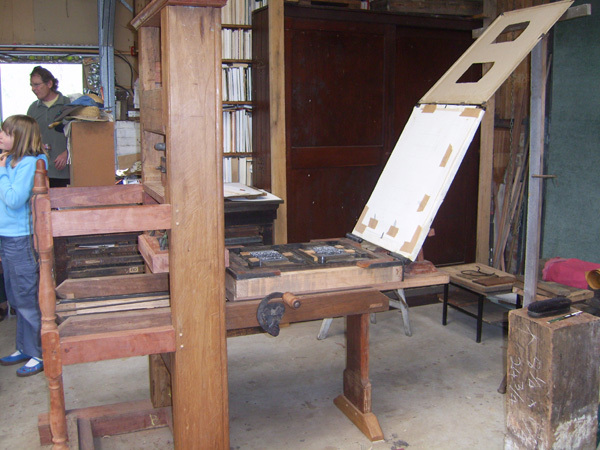 There is a thread on Briar Press about the possibility of building such a press, and I can’t wait for Richard to receive the praise he deserves for achieving it. He hopes to move it to somewhere more accessible, but in the meantime he will show it by appointment to anyone who is interested. You can read his contact details on the letter at the start of this post, otherwise feel free to email me and I will pass on his details. If you want to see more images of the press and the day's proceedings, go to my flickr set. What an incredibly moving post this is. My goodness. I am off to tweet!! tout de suite. And will be in touch about sampling and quoting from it. My first thought is that it's amazing what guys will get up to in sheds. But what a project. And how generous to wait for everybody else to do the first print! mmmmm... how tasty is that!? I'm very interested in the metal screw, for example. I was lead to believe that early presses used a wooden screw and needed to be built into buildings to be able to use enough downward pressure to get a good impression. see how the press is wedged against the ceiling in the woodcut you've used? certainly the first presses were modified wine presses, and they would have used wooden screws for centuries. it'd be nice to find out when metal was affordable and became the norm. also, there's debate on the net from a few years ago about the Gutenberg bible and whether movable type was definitely used. some bloke put an ultra-ultra-ultra ginormous scan of a copy on the net, and another bloke studied it and could see definite proof that the impression was made by movable type. I read a bunch of stuff about it a couple of years ago and don't have the bookmarks any more... typical. but I found it very interesting. because really, there's no absolute proof that Gutenberg did half the stuff people reckon he did. he's just very convenient to hang a lot of hats on. Richard must be an amazing person! That was so interesting and delightful, and discursive, that by the time I had finished reading it I had completely forgotten that Stephen Fry existed. What a blessed relief that was. 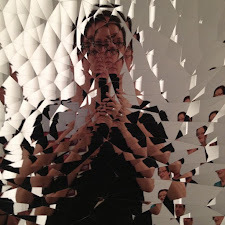 A wonderful blog. A delight to read. Thanks. Thanks for this wonderful post. It is so nice to hear about fabulous Australian bush eccentricity and beautiful crafts(wo)manship. And in my favorite part of the world! Cheers from the jungles of Laos. Did you know your blog is catalogued on the ACT Library and Information Service catalogue?! REALLY, SS? How cool is that? What a good story.....I need to read it at length again later. Your cat loving readers may be interested in this site http://www.thecatshouse.com/index.htm Two blokes have set their house up as cat paradise. Awesome! I got all excited just reading the story! oh what a fabulous captivating story - i saw the stephen fry show and thought it might be a one of a kind english eccentricity happening but am so glad there is at least one other. it is an object of beauty too - and look at those inkaballs! how many roads must a woman drive down?